Butler Newsroom | Butler Wins Six Forensics Trophies at Ohio U.
Butler Newsroom > College of Communication > Media, Rhetoric & Culture > Butler Wins Six Forensics Trophies at Ohio U.
Butler Wins Six Forensics Trophies at Ohio U. The Butler Speech and Debate Team brought home six trophies from the Ohio University Forensics Tournament last weekend, one for each event in which the Bulldogs competed. Junior Marcus Harvey (pictured left) took third place in Dramatic Interpretation, and fourth place in After-dinner Speaking and Poetry. He also took the prize as third speaker overall. Junior Ciara Williams (pictured right) placed second in Programmed Oral Interpretation, and fourth in Dramatic Interpretation. 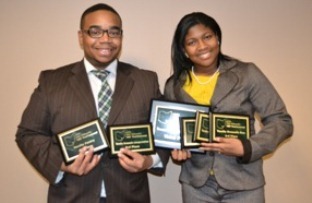 Together, Williams and Harvey earned third place in Duo Interpretation. The Butler team placed third overall in the small entry division.